We spent the weekend of Live8 in London. On Friday evening we went to The Royal Opera House where we saw "Otello" by Verdi. The venue was impressive and the performance was first class. 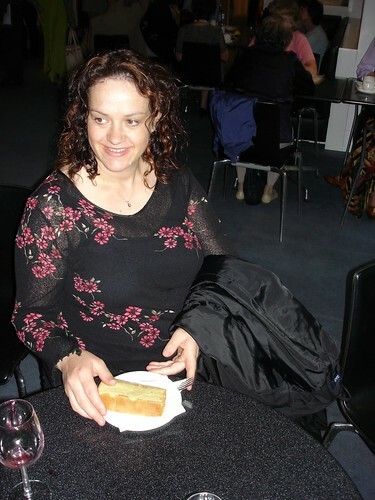 We also enjoyed the cake in the Amphitheatre Bar. 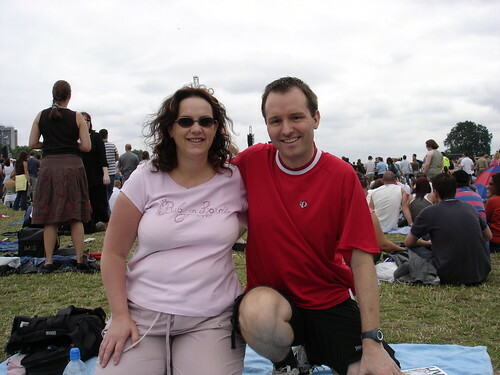 On Saturday we went to the Live8 concert in Hyde Park. Live8 (in case you've been on another planet) was a group of concerts in each of the G8 countries and South Africa to draw attention to poverty in Africa and particularly to put pressure on the G8 leaders meeting a few days later. An online petition was created at the Live8 Live website. As the tube trains were likely to be packed, we walked to Hyde Park from our hotel in Westminster. Unfortunately when we got there we found that there was a queue 2Km (1.6 miles) long around the park to the one entrance for the concert. We queued for 2.5 hours. Hayley brought her handheld fan and did brilliantly to stay the course given that she was 7 months pregnant. We were still just outside the entrance when the concert started. But having missed the first few minutes we got in and had a great day. REM's set, Pink Floyd's re-union and Paul MacCartney's finale were highpoints, but Robbie Williams stole the show with a crowd-pleasing performance. There are some photos from the weekend here.